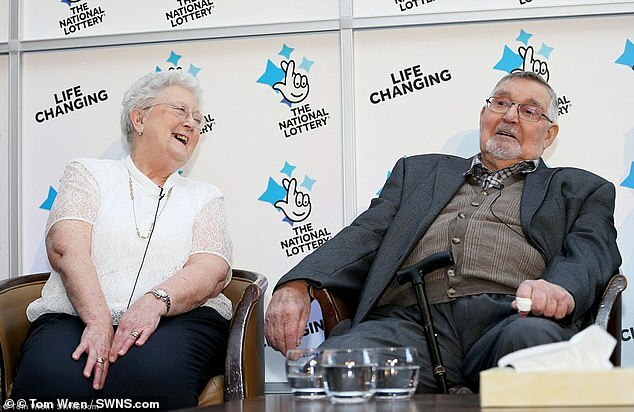 They could have bought a mansion, but Britain’s oldest lottery winners are returning to their modest home of 57 years – after spending four months living in a budget hotel. Dennis Banfield, 87, and wife Shirley, 83, have been married for 60 years and lived in the same house for most of them. They scooped an £18million jackpot in February, but rather than move into a plush new pad, the couple have opted to renovate their family home. They brought up their two daughters there after buying the property in 1961 – when the average house in Winterbourne, Glos, cost just £2,000. But the couple didn’t head to a luxury resort while the builders were in – opting instead for a nearby budget hotel, with rooms costing £66 per night. Speaking outside the hotel yesterday, the couple said they are looking forward to moving back into their home before Christmas. Shirley said: “We decided to stay in the house and just have the whole of the inside of it completely redone. “We’ve been there for 57 years now. We know the area, the house is not overlooked, it’s got a lovely big driveway. “We’ve gone back to see it as it’s been done up. 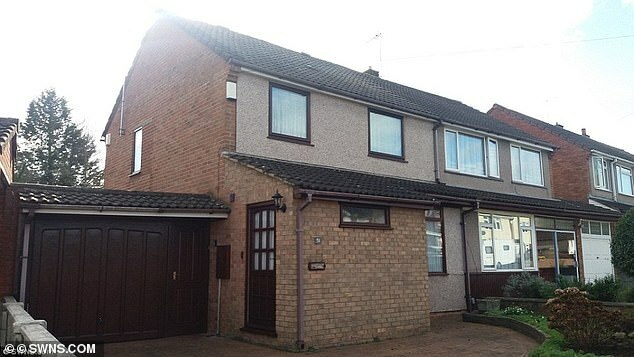 The three-bed property has a current estimated market value of £316,000. The front garden is still full of fittings that have been torn out for the renovations and a large skip in the front garden is full of plasterboard – with a decorator’s van and a skip parked outside. But the generous couple, who have given away a lot of their winnings to charity, revealed they are simply looking forward to moving back and spending a quiet Christmas at home with family. That includes their daughters – with whom they split their lottery winnings. The elderly couple also revealed they had told Tina, 55, and Karen, 52, that they always played for them, to secure their future. 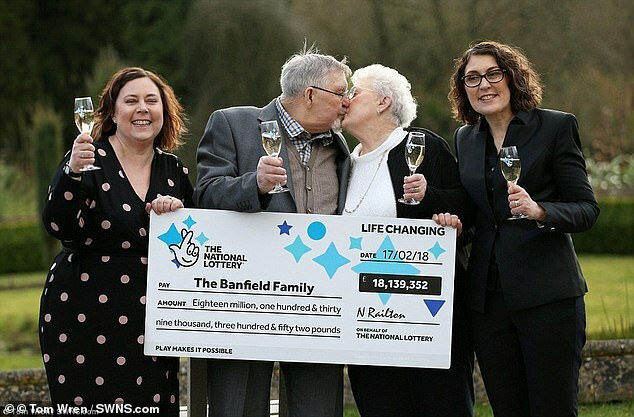 The Banfields split the money three ways, Tina and Karen getting just over £6million each, with Dennis and Shirley keeping the remaining third for themselves. As to their own share, Shirley explained: “We’ve given a lot of it away in lump sums. “We’ve been able to give to the cancer units, to the children’s hospital, as well as helping out our community in Winterbourne – and giving to the chapel and the community association. “I wouldn’t say the money has changed us – it’s only prompted us to better other people. 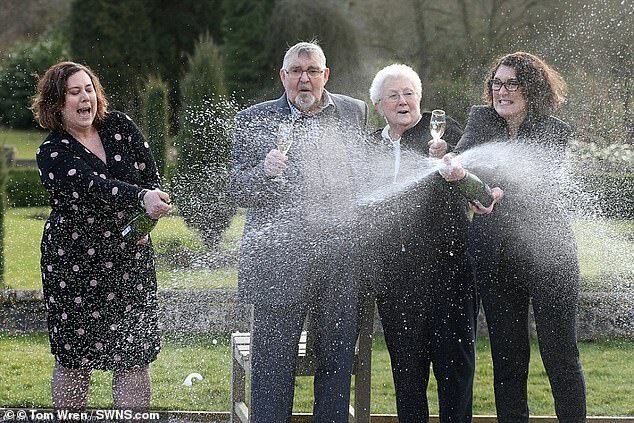 However, when the couple won the £18,139,352 jackpot in February, Dennis had to wipe away tears of joy as his family revealed it was he who had bought the ticket form his local shop. He added: “While I didn’t think I would be interested in a new car, it is rather tempting. Meanwhile, the search for the winner of a £76million lotto prize is intensifying, with just days to go till the 5pm Sunday deadline. The winning ticket was bought in the Boston and Skegness region of Lincolnshire for the November 2 draw.